“The bowl holds around a cup of water and rings in under $10." Looking for something that’s smarter than your average bowl? The Petmate Pearl Replendish Waterer allows your pets to drink cool, purified water whenever they want it. Consisting of a bottle that feeds into a bowl beneath, the waterer’s charcoal filter removes any pathogens and impurities, while a layer of Microban prevents bacteria growth around the bowl. Available in sizes from a half-gallon to four gallons, it saves you the effort of refilling your cat’s water or topping it off to keep it cool. The bowl itself is dishwasher safe, but the bottle’s wide mouth makes it easy to hand-wash.
Customers write that the Petmate Pearl Replendish Waterer has a heavy base that makes it virtually impossible for cats to tip it over—a definite bonus if your cat is the curious sort. The bowl itself is also large enough that pets aren’t constantly waiting around for it to refill, and the filter lasts longer than most products in this category. Looking for a way to keep your cat well fed too? Check out the best automatic cat feeders here. While there are some surprisingly pricey water bowls for cats available, there’s thankfully no shortage of budget-friendly items. But spending less doesn’t mean sacrificing on quality or design, and we love the simple, handmade look of Ethical Pet’s Stoneware Crock Cat Dish. This ceramic bowl is weighty enough to keep from moving around on the floor but has a subtle and stylish appearance that blends well with most decor. Even better? It rings in under $10. The bowl holds around a cup of water and cleans easily, either by hand or in the dishwasher. Customers write that the Ethical Pet Stoneware Crock Cat Dish is well made and just the right size, with a broad enough diameter (5.25 inches) to keep wet whiskers at bay. It’s also virtually impossible to tip over, making it a great pick for owners of cats who like to play with their food and water bowls. A fountain-style bowl constantly circulates water through a filter and out a spout, keeping it fresh and allowing multiple cats to hydrate at once (and encourages them to drink more often). The Veken Pet Fountain uses a flower-style spout with three different flow settings, so you can experiment and see which your cat or cats prefer. It uses a quiet pump that easily fades into the background, and includes three activated carbon filters to remove impurities and keep your cat’s water clean. It holds 2.5 liters of water and is sold in both blue and gray designs. Customers love the Veken Pet Fountain’s quiet operation, which helps make cats take to it quickly—no scary sounds here to keep them at bay. The free-falling water is more appealing to many cats than still water in a bowl and saves owners the energy of swapping it out when it starts looking a bit old. Here are even more cat water fountains we love. If your cat hates getting their whiskers wet or having them brush up against the side of a bowl, go with a wider design that gives their face a bit more room during drinking. 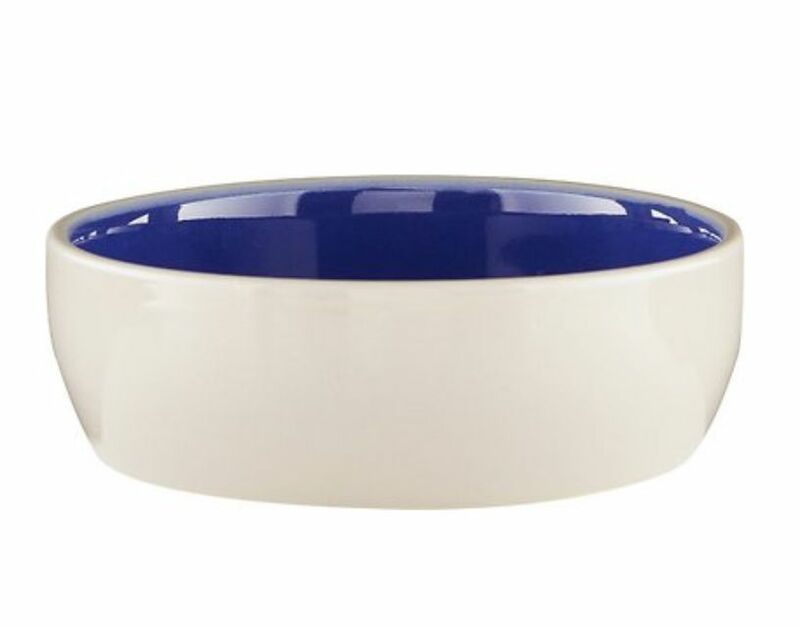 The PetRageous Designs Metro Oval Pet Dish has a simple and appealing hand-painted design, and its oval shape is wider than most bowls (it measures 6.25 x 1.5 inches). Each bowl is over-fired to resist chipping and fading, and it’s both dishwasher and microwave-safe. Just bear in mind that the trade-off of using a wide-set bowl is that it will be slightly more shallow, so it may need to be refilled a bit more often. Customers love the handcrafted style of the PetRageous Pet Dish, with thick, quality ceramic and paintwork. But more importantly, they give cats plenty of room to drink without their whiskers getting in the way, accommodating their whole face without whiskers brushing the sides. There’s nothing like cool water on a hot day. But since cats can’t exactly go and pour themselves a glass, cooling bowls can make summertime hydrating a lot more pleasant. The K&H Pet Products Coolin’ Water Bowl uses interior “cooling crystals” that activate after the bowl is placed in the freezer, and keep water cold for up to 15 hours. The bowl holds 96 ounces of water and requires no electricity to run. The crystals are also non-toxic, and the cooling time can be extended even longer by freezing an inch of water in the bowl before use. Customers are surprised by how well the K&H Pet Products bowl works given its simple design, often testing it every few hours to find, to their amazement, that the water is as cold as they’d left it. In fact, some found that it keeps water cool even if you don’t freeze it first. It’s also on the heavy side, which helps prevent cats from moving it around on the floor or causing spills. Made of high-grade stainless steel, the PetFusion Premium Brushed Cat Dish is built to stay attractive and rust-free for years to come. Stainless steel has a modern look that’s incredibly easy to clean, and the brushed finish here is sleek and appealing. It’s also shallow enough to keep cats with sensitive whiskers happy, measuring 1.1 inches in depth (it’ll hold 1.5 cups of water). The outer ring makes it easy to quickly grab off the ground for a refill. This is a bowl that should last forever, customers write of the PetFusion Premium Brushed Stainless Steel Cat Dish. While a plastic or ceramic bowl may degrade or chip over time, this one should hold up for years. One suggestion: put it on a silicone mat to keep it from sliding around. Want to treat your cat with a new toy? Check out our favorite cat toys you can buy right now. Whether you have two cats or you want matching food and water bowls, the Ureverbasic Two-Pack Cat Bowl Set is an affordable and durable set for felines of any size. They’re available in a wide selection of fun color combinations, all with high-quality stainless steel that won’t get corroded. Each bowl holds four ounces of water, and an anti-skid pad prevents it from slipping on the floor. They’re also dishwasher-safe and quickly rinse clean under a faucet. Customers write that the Ureverbasic Two-Pack Cat Bowl Set is functional, attractive and come at a reasonable price point. One note—they’re on the smaller side because they double as food bowls (with the idea that the smaller size prevents overeating). It’s generally still enough for at least a day’s worth of water. A raised cat bowl is a great way to reduce unnecessary stress on aging feline joints and make it easier for your cat to drink. The Necoichi Raised Cat Water Bowl helps reduce neck strain and allows you to monitor your cat’s water intake with pre-measured milliliters lines. This non-absorbent porcelain bowl can hold up to 1 ⅛ cups of water and is dishwasher and microwave-safe. The bowl measures 5.1 x 5.1 x 2.9 inches and features a classic black-and-white paw print design that blends in well with any home decor. Plus, an inner lip helps reduce spills and leaks. Owners appreciate that the Necoichi holds enough water for multiple cats and won’t spill or splash out. Many also note that the bowl is sturdy but lightweight and easy to clean. If your cat is suffering from arthritis, a raised bowl can be a great way to entice your feline to drink.